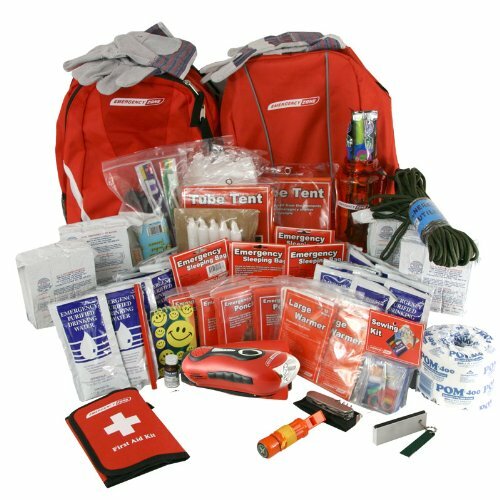 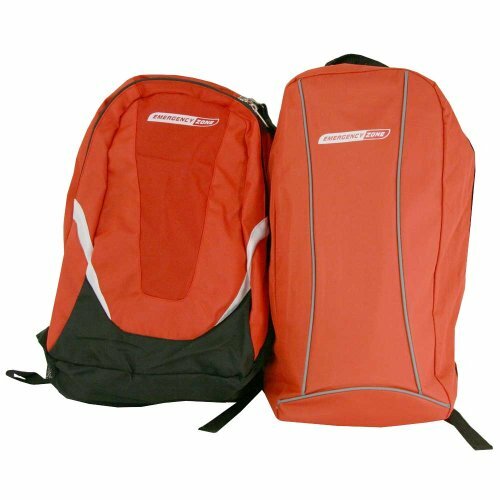 This kit includes the following: 1 Organizational Backpack, 1 Large backpack, 1 Dynamo AM/FM radio and flashlight with lithium ion battery-rechargeable with a hand crank, 4 eight hour light sticks, Magnesium Firestarter, 4 emergency reflective sleeping bags, 4 emergency ponchos, 2 tube tents, 6 emergency candles, 4 3600 Calorie US Coast Guard approved Food Bars with a 5 year shelf life (SOS brand coconut flavor), 24 US Coast Guard approved Water Pouches (125ml each) with a 5 year shelf life (SOS brand), 1 bottle of 50 Potable Aqua water purification tablets (Aquamira brand), 1 Lexan bottle (1L), 1 multi-tool knife, 1 5-in-1 survival whistle, 1 50 ft. rope, 2 pairs of work gloves, 4 N95 masks (individually wrapped to keep clean), 1 deluxe first aid kit, 1 hygiene kit (4 toothbrushes, toothpaste, comb, washcloth, 10 tissues, 24 wet naps, shampoo), 1 roll of toilet paper, 1 note pad, 1 pencil, 1 sewing kit and 1 Emergency Preparedness Guide.____________ ___The 48 page HOW TO PREPARE FOR ANY DISASTER gives you the steps to preparedness. 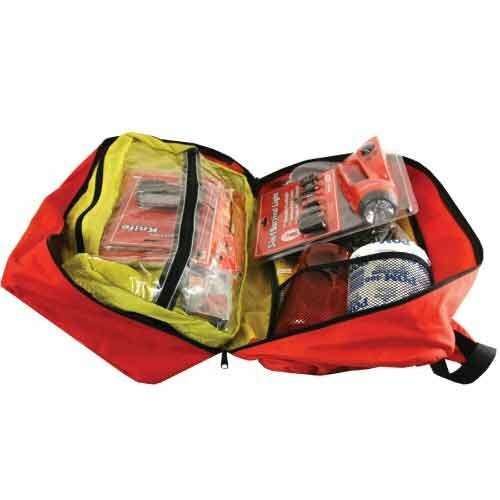 It includes emergency checklists, preparedness tips, what to do before, during and after a disaster. 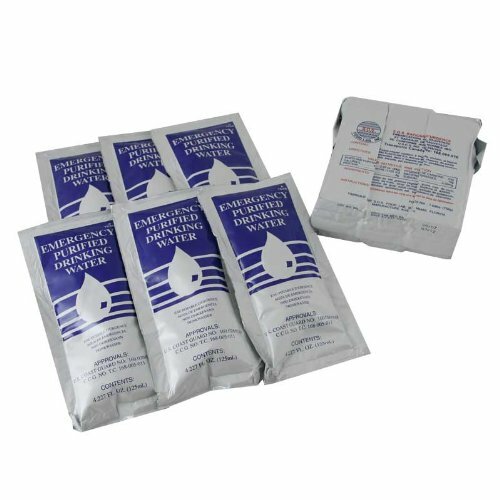 Includes the 48 page How to Prepare for Any Disaster book to help you before during and after a disaster. 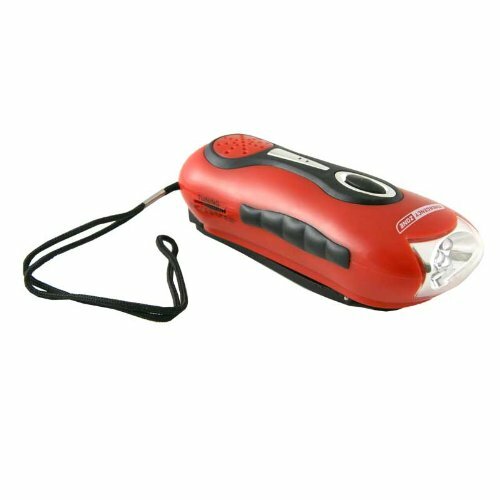 Lithium Ion hand crank rechargeable AM/FM radio flashlight.